Make a note of it: I’m wearing a skirt today. During the middle of aerobics class this morning, one of the girl’s from the daycare area walks in and starts whispering into the instructor’s ear and after she left, we all paid dearly for whatever it was her son had done. It sucked. There were two other instructor’s in class this morning and even they were moaning and groaning. I swear to God, if you could record just the audio in that room during the toning portion of the class, a guy could really get off on all the moaning. Anyways…..because of our night out Saturday and staying up all night chillin with my bro-in-law and then dragging all the kids up to Aviation Day yesterday, I was exhausted and went to bed at 6:30pm…I was just gonna shut my eyes for an hour and get up and watch a movie with my husband, but I slept all night. I wake up and come downstairs this morning and the house is trashed. It’s just not fair. Taking a break should be a break. I shouldn’t have to pay for it when I get back in touch with reality. Just doesn’t seem worth it and that’s pretty frustrating. I’ve got MUCHO work to do. Yeah, she would bring him with her, so what’s the big deal! She’s so dumb! 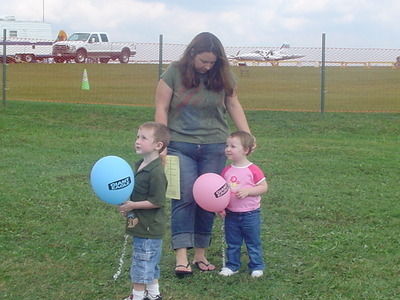 My Chris would have LOVED Aviation Day. I wish they had something like that around here. It’d be a cool thing to do with him. I’ve been a little out of commission lately. How are you, Steph? Really? awww cute pics! you look like you’ve really lost some weight girl! maybe its not such a horrible thing for her son to misbehave in daycare after all? but seriously you look fantastic! aww fun…fabulous pictures! I am sorry you have such a mess to clean up today, though…just when you think the work is over…*sigh*… 🙂 Thanks for your sweet words on my post. I FEEL better..and thats an awesome thing to be able to say…i really dont know when the fog lifted or how…it just did. anyone that says miracles dont happen…must be walking around with their eyes closed. great pics! Thats funny about the aerobics class and all the moaning. LOL Hope you had a great day. I know what you mean about the “break” thing. Guys are so insensitive sometimes. They really have no clue! lol. i liked the comment your friend made to the officer. yeah. I don’t like to think of police officers like that – but i guess there are good and bad in all occupations. are you recovering well from the aerobics class?